Add live scores, schedules, standings, box scores or any other sports data widgets into your website without any development effort. The most comprehensive sports data solution is now available with advanced features, global coverage, online purchase and easy integration. Created in responsive design, coming with 100+ configuration and layout options, enhanced theme features, 8 language support. Broadage Sports Widgets cover the world’s most major professional leagues & cups from 112 countries worldwide. Before you buy, try our widgets free with full functionality for 15 days. Then you can switch between plans (or cancel) when it suits you. Focus on your business, let our hosted widgets do all the tech job for you. Do not lose any of your time and money for development and hosting. You will have the total control of your widgets via admin panel. Manage your account, monitor your daily usage stats, configure & customize your widgets online. You can get started online easily and insert your first widget in a minute. No coding skills required. Various docs & tutorials available. With over 60 widgets, you will find all you need for building stunning sports pages. Our widgets cover the world’s most major professional leagues and events ranging from NFL, MLB, NBA, NHL, English Premier League, Bundesliga, UEFA Champions League to the global events like World Cup. Whichever plan you choose, you will have access to all our widgets of 500+ sports events worldwide. 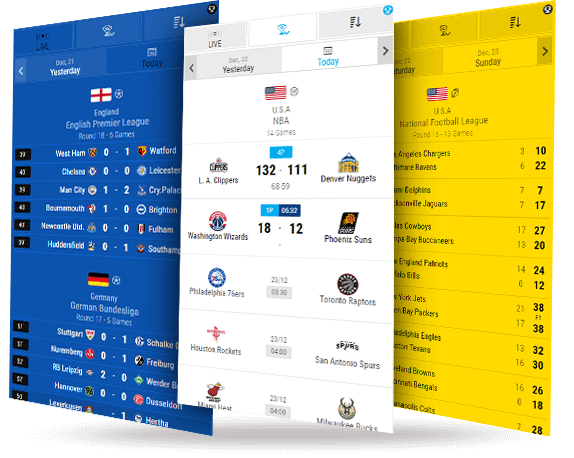 Widgets for both popular European sports like Soccer, Basketball and US sports like American Football, Baseball and Ice Hockey. 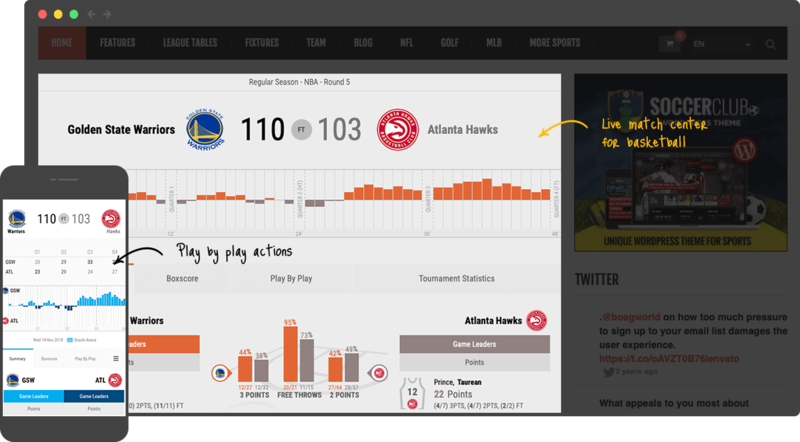 Ready to use, visually enhanced live sports data widgets specifically designed for tournament and team pages. Localized for most common languages from all around the world; English, French, Spanish, Arabic, Portuguese and more. Global coverage including Europe, Americas and Asia with major International sports events, both for club and national teams. 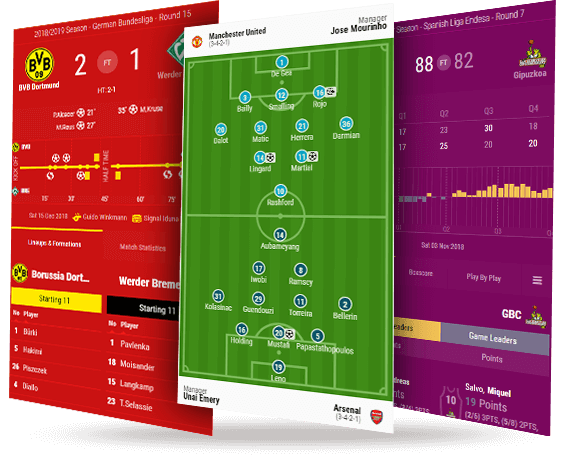 Hundreds of competitions tracked to provide sports data as livescores, live events, boxscores, team and player statistics. 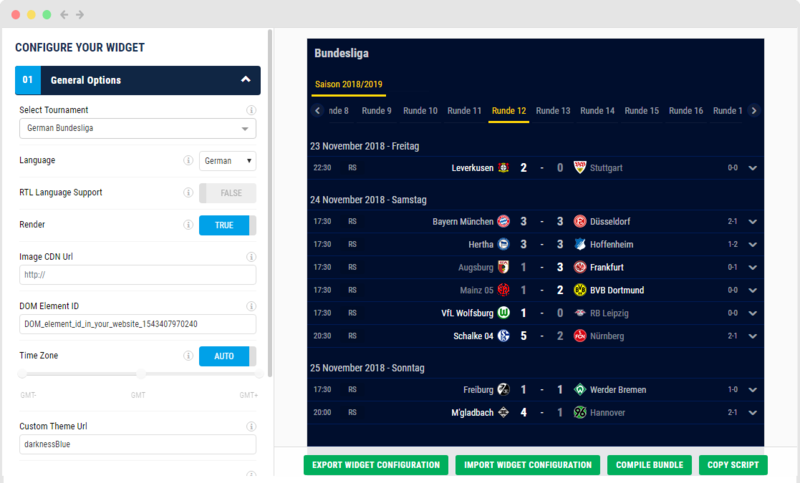 Enrich your digital platform with live Broadage Sports data widgets just in few minutes. Broadage Livescore Widget is designed and developed to meet the industry needs. 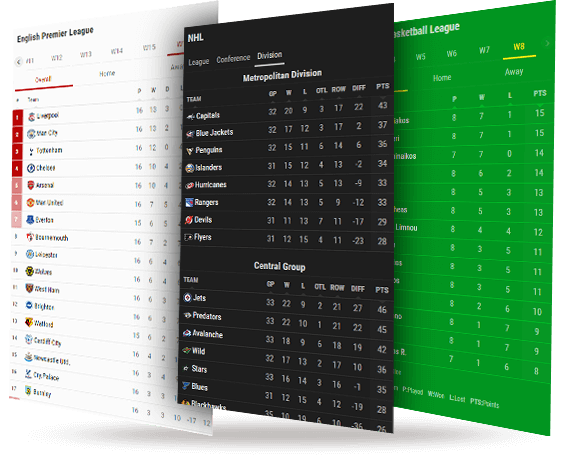 Three livescore options are available in various sports; Livescore, Livescore Detailed and Liveticker. 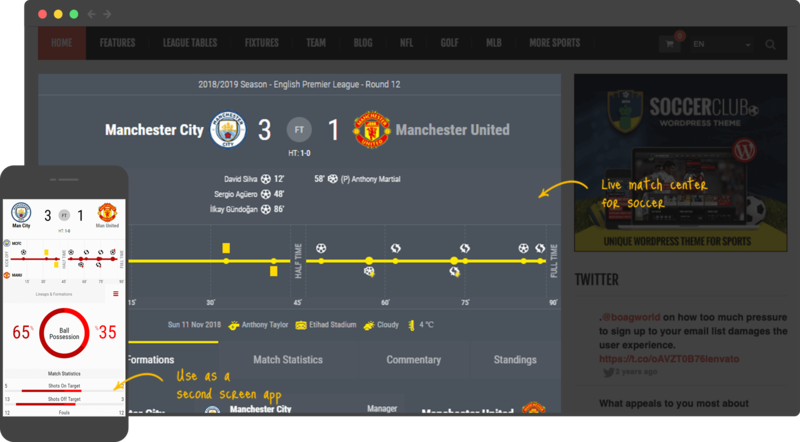 The Livescore widget is a flexible widget offering live sports data enables you to present multiple and singular sports in a same page. 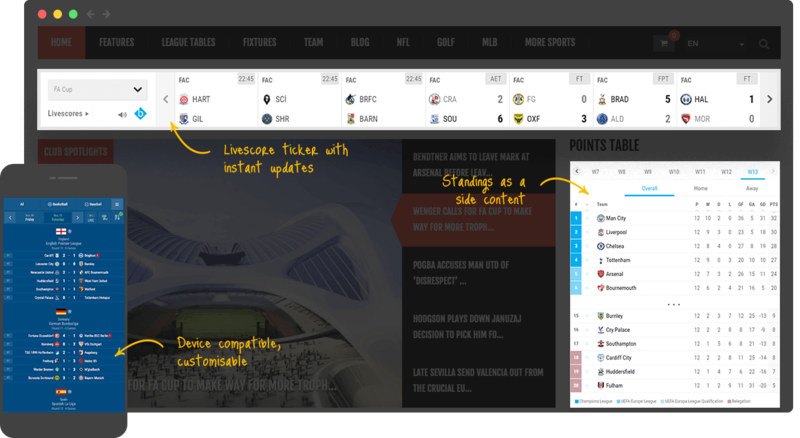 Livescore Detailed provides summarized data for each match, keeping the user in the same page while giving more information. Liveticker is a live widget most popularly used in home pages of sports portals. Broadage Standings Widget show rankings of teams in a specific competition. Advanced Features lets you to navigate through group standings of Champions League or see how Bundesliga league table shapes up. Additional data such as team form and next match information support the concept of standard standings. It’s now possible to show the home or away performance of an NBA team, the league standings, conference standings and division standings, all in the same widget. Weekly schedules and match summaries for the tournaments. Upcoming matches with additional match information such as referees, venues, weather forecasts. 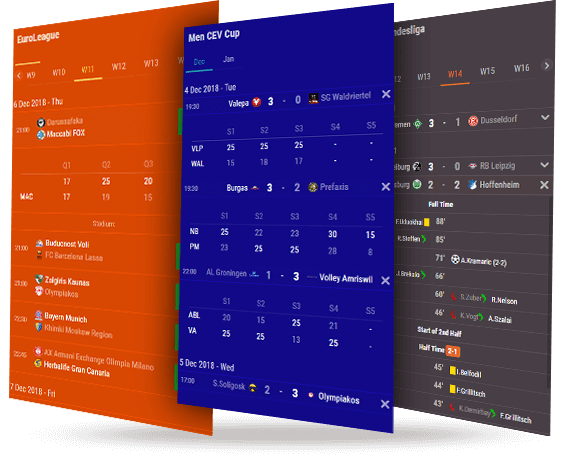 Fixtures widget comes in with features such as expandable match summaries, advanced data filtering and navigation options. 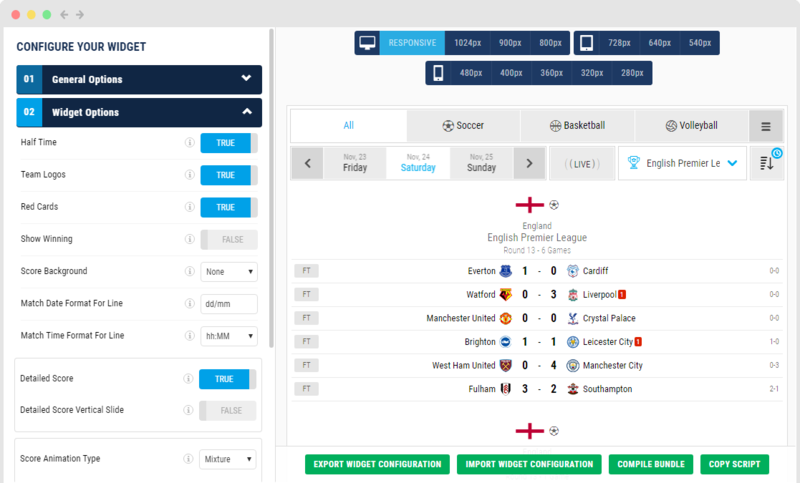 You will be able to show the schedule of English Premier League in one page and the results in another one, using the same widget with just adding a parameter to the configuration. 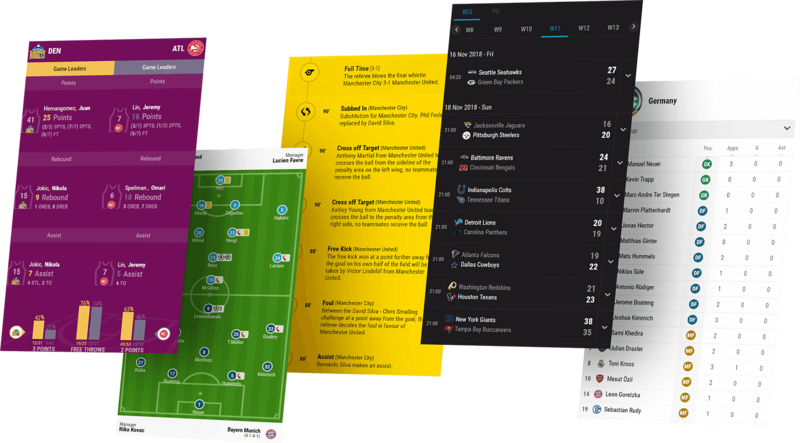 Broadage Live Match Center Widgets are the plug and play sports data streams, presented as bundles of multiple widgets for Soccer and Basketball. Soccer Match Center and Basketball Match Center bundles include widgets such as Scoreboard, Timeline, Match Info, Lineups, Formations, Live Commentary, Live Match Statistics, Boxscore, Play by Play and H2H Standings. With its modular structure, it’s all up to you to whether use the standard bundle or create a unique live match center for your company. Change the tabs, position of widgets or insert your own elements to create advertising areas within the match tracker page itself. 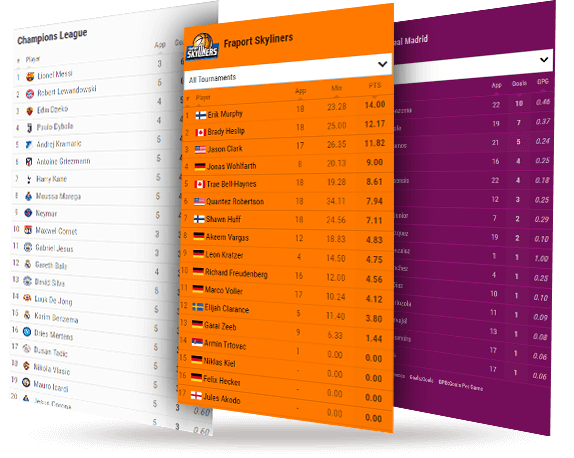 Broadage Leaderboards Widgets are designed to show the top players in a specific stat for a tournament. Top scorers, most assists, most rebounds and disciplinary records present the player statistics along with complementary performance data showing how much a player contributes to his team. 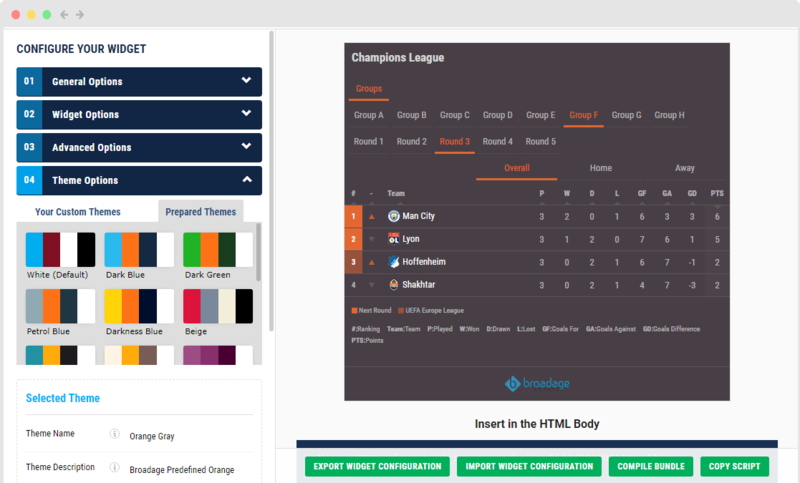 Tournament based or team based, leaderboard widgets are ideal for your World Cup event center, tournament page for the Spanish La Liga or team page for Manchester City. Compare the players within their team or tournament, the way you would like to do so. Try Broadage Sports Widgets free for 15 day. No risk and no credit card required. As a free trial member, you can start using all the widgets right away. Change the data presentation, user experience or the look and feel of the widgets with the Online Widget Configurator. Subscribe our newsletter now and be updated for all the great features and widgets that are coming up. Thank you. Your subscription is successful.